Urban Nomad from Brintons features culturally inspired designs blending tradition with bold colors and patterns. Stacy Garcia is more than a leading international designer; she is also the founder of multiple business enterprises. She has partnered with some of the world’s leading manufacturers to create products that span from floor to ceiling for resorts and homes all over the world. As such, her work has been featured in Interior Design, Boutique Design, New York Spaces, LUXE, Rue Daily and Architectural Digest. The business that bears her name is a leading licensing and design company with a collection of global lifestyle brands that add a well-traveled and sophisticated edge to fashion and interiors. With roots in hospitality design, the company has expanded to three brands: Stacy Garcia Commercial, Stacy Garcia | New York and Stay by Stacy Garcia. Product lines span categories from carpet and textiles to wallcovering, furniture and lighting. Green Operations recently sat down with Stacy for an equally as expansive interview. 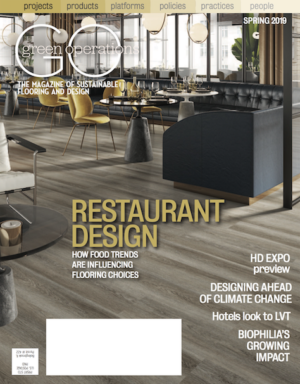 Q: IS HOSPITALITY YOUR PRIMARY FOCUS WHEN IT COMES TO COMMERCIAL SPACES? Q: DO YOU DESIGN DIFFERENTLY FOR A TWO-STAR HOTEL VS. A FOUR-STAR HOTEL? A: I believe quality design is expected at all levels of the market today. That being said, we approach all of our design collaborations thinking first about who the end user will be. We pay attention to how the product will be used based on the clientele and ultimately the maintenance of the property. For example, in a two-star property we would design furniture that has legs with a kick under it so housekeeping will know how to handle it. Case goods at this level are designed to withstand the impact of a vacuum cleaner. Our four-star products have more mixed materials, metals, acrylic and custom wood finishes that speak to the expectations of the hotel guest while still maintaining standards of commercial application in terms of durability. The nice thing is there is a universal aesthetic that comes out of my studio. It is always through the lens of Stacy Garcia and always has a contemporary flair. The brand is known for interesting color, unique textures and bold patterns. Composite illustrates Stacy Garcia’s designs for Lexmark Hospitality, which tend to be more monochromatic, simple and understated. Q: WHAT IS SIMILAR AND WHAT IS DIFFERENT IN DESIGNING A CARPET PATTERN VS. ANOTHER PRODUCT CATEGORY? A: There is definitely overlap with designing patterns and textures for carpet vs. wallpaper or textiles. We have signature patterns that have been successfully carried through to multiple product types. The same rules apply no matter what category we are talking about. The goal is always to achieve balance and harmony between the motif, texture and color combination. If a design has these elements it can be successfully applied in multiple categories. 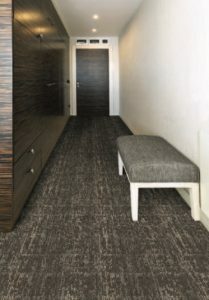 The main differences in designing carpet vs. other surface products are scale and technique. With a floor, you have a huge surface area where you can go large in scale but you wouldn’t necessarily do the same on a textile or upholstery fabric. Something that we are having fun with is experimenting within the textile and wall covering categories because technology is allowing us to create larger designs than were ever possible with traditional manufacturing processes. We are not limited to screen size or cylinder size anymore. The future could have these categories even more similar than ever. Q: WHAT ARE YOU FINDING THE COMMERCIAL END USER LOOKING FOR THESE DAYS AS IT RELATES TO CARPET? A: Flexibility. I think one of the main reasons carpet tile is getting so popular is because it allows flexibility in design — you can lay in a pattern like wood or ceramic, creating some- thing new all the time. Also, you have peace of mind that you can pop out a carpet tile if it gets damaged rather than replacing the entire broadloom. I think no matter the commercial application, the end user is looking for appearance retention, so much of the concern being will it look good over time? That is why we have a balance of cut and loop in the carpets we design. We work from both a technical and creative perspective to design interesting products that will last. Finally, on the flooring side, hard surface is huge. You are seeing a lot of LVT — it really looks good and installs with minimal downtime. of Mohawk. It has a lot of geometry and architectural influence. Another big motivator for me is nature. We just won an award for our Traces collection, also for Durkan, which previewed at HD Expo. The textural patterns are reminiscent of crystals, snowflakes and timeworn cracked clay. The third inspiration comes from fashion. One of the huge trends happening in fashion now is bohemian looks inspired by Coachella music festival. With its free-spirited approach our Urban Nomad collection for Brintons illustrates this fashion inspiration beautifully. 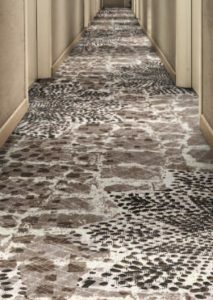 The textural patterns in the award-winning Traces from Durkan are reminiscent of crystals, snowflakes and timeworn cracked clay. Q: GIVE ME A FEW ADJECTIVES THAT PEOPLE CAN ASSOCIATE WITH THE PRODUCTS YOU DESIGN — SPECIFICALLY FLOORING? A: Contemporary. Liveable. Comfortable. Patterned. Bold. Eclectic. Well-traveled. Q: IS SUSTAINABILITY IMPORTANT TO THE PRODUCTS TO WHICH YOU ATTACH YOUR NAME? A: It’s really the cost of entry. If you are not environmentally friendly as a company and not building in sustainable practices, you won’t be doing business very long. Many social issues are coming up of late, and sustainability is one of them. For us it’s important that our partners are an extension of our brand, and we choose our partners carefully based on multiple factors such as sustainability and social responsibility. Q: MOHAWK (DURKAN), LEXMARK AND BRINTONS ALL a MARKET YOUR BRAND. TALK ABOUT THE PROCESS AS TO WHO GETS WHAT? nylon. Brintons produces our wool Axminster collections that are designed to highlight that process using up to 32 colors. Our Lexmark collections are designed for hospitality guest room applications, and the designs tend to be more mono-chromatic, simple and understated. Our goal is to offer all of our patterns in any of the constructions that the designer might need for their projects, which at all levels. 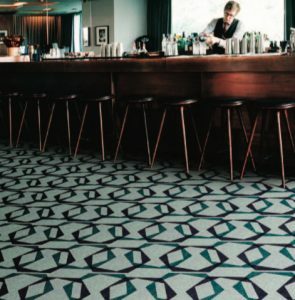 Q: GIVE ME SOME HIGH-PROFILE SPACES WHERE WE CAN FIND STACY GARCIA-DESIGNED CARPET. Rodeo Bar and Grill, Queensland, Australia; Hotel Engimatt Zürich, Switzerland Negombo Beach Resort, Sri Lanka. Q: YOU’RE INVOLVED WITH COLOR MARKETING GROUP, WHICH MEANS YOU ARE INTO FORECASTING. HOW DO YOU FORECAST? future. We help our manufacturing partners use forecasting as a competitive advantage by designing collections that keep this information central. Q: LOOK INTO YOUR CRYSTAL BALL AND TELL ME ABOUT THE DESIGN FORECAST FOR 2017 AND 2018. 1940s Tropic, Pacific Rim, Traces, Hippie Chic, Morocco to Madrid, and Urban Dweller. You can find more information on trends by checking out my blog — life-styled.net. Surfaces from Durkan offers geometry and an architectural influence. Q: WHAT’S THE DIFFERENCE BETWEEN A TREND AND A FAD? A: I often hear people say, “I don’t follow the trends,” but what they really mean is they don’t follow fads. An example of a fad would be flash tattoos and silly bands; people go crazy for a short period of time but are quickly over it. When looking to spot a trend, look for evolution not revolution. A trend builds up over time and has power that is maintained. To determine a trend, we must constantly be in tune with what is going on around us. Movements build up slowly over time. What we see is not the rise and fall of single trends developing on their own, but the evolution of one turned into another as tastes evolve. Q: HOW HAVE YOU AND THE BUSINESS EVOLVED OVER THE LAST FIVE TO 10 YEARS? 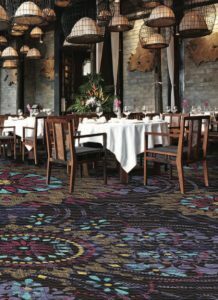 A: I founded Stacy Garcia Inc. in 2004 as a design studio producing collections of fabrics and carpets for the hospitality industry. Since then, we have made the shift from a 2-D studio into a product design house and have four active furniture licensees as well as a lighting collection. Today we have three distinct brands along with 13 active licensees, including Bernhardt Hospitality, York Wallcovering and Mohawk. Today, we are more than a studio; we are a global design house that continues to produce inspired product collections. Our newest collection was a collaboration with Sunbrella to produce an indoor/outdoor textile line called Seville. Q: TALK ABOUT WHAT YOU BELIEVE TO BE YOUR GREATEST ACCOMPLISHMENT FROM A DESIGN STANDPOINT. A: After years of working in the hospitality industry, it was definitely an accomplishment last year when I launched Stacy Garcia New York, my luxury, to-the-trade residential brand. We introduced the wallpaper collection at DIFFA in New York and followed with a bespoke furniture collection in the fall. Q: Opportunities and challenges going forward? A: I really am looking forward to growing the Stacy Garcia New York offering, and we are putting the finishing touches on our first fabric collection due out in 2018. In addition, I see more crossover between our brands as many of our clients work on both high-end residential and commercial interiors. We see a ton of opportunity to provide the client with gorgeous products and let them determine the best place to specify them. The challenge for me remains how to maintain balance. With four children and two businesses there is always something that needs my attention. I basically thrive on action but sometimes I just need to schedule a yoga class. Q: Any plans to get into hard surface flooring? Wood maybe? A: Definitely. Hard surface flooring is gaining in popularity, and I believe there is room in the market for interesting textures and design in this arena. We actually partnered with West Flooring and Design on a show house I was involved in. The chevron wood flooring we created in five shades of green stole the show.